Do you think of a big bag of buckets when you hear the term bucket bag? Then you haven’t heard about this stylish “it” piece yet. A cool bucket bag is proper “arm candy” for fashionistas. Bucket bags are a trendy alternative to the classical shoulder bag. The name comes from the shape of the bag which is vaguely reminiscent of a bucket. These bags typically feature a drawstring closure - which creates a casual look and makes the bag easy to open and close. At JustFab you can buy these chic bucket bags online and at affordable prices - now you can create fashionable casual looks with ease. The shape of the bucket bag alone makes this an eye-catching accessory. These stylish bags are available in many sizes - from small and compact to extra-large and spacious. You can also buy them in a variety of materials like leather, suede, high quality imitation leather or even canvas fabric. A black bucket bag goes with everything and the same can be said for bucket bags in muted tones like brown, cognac, beige, grey or white. Or are you looking for something a little more unconventional in a bright statement colour? An attractive detail or a bold pattern on your bucket bag will also give your look that certain something. Start with some accessories in the autumn/winter trends before you don the look from head to toe to see if you can pull off the latest fashion trends. Two of the hottest trends this season are the colour red and tassels and both can be easily incorporated in a bucket bag. For instance, a bag with fringe detail on the drawstring will create a romantic boho-chic vibe while a red bucket bag becomes an ultramodern accessory that can be used to add a pop of colour to darker outfits. A bucket bag is more of a casual bag, making it the ideal choice for a stylish weekend look. Imagine a black bucket bag paired with jeans and a turtle neck jumper to create a cosy look. 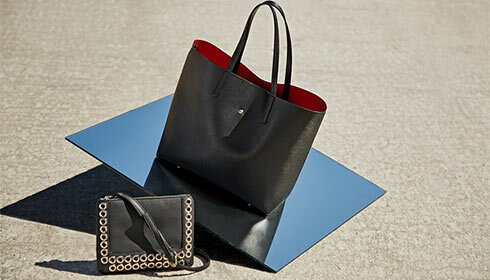 This stylish bag is also the ideal choice for long, relaxed weekend brunches with the girls. Or wear your brown or cognac bucket bag with a cute chequered dress for a chic autumn look perfect for a weekend stroll through town. Or, how about a bucket bag with fringe details combined with a mini skirt, an oversized jumper and a cute slouchy hat to create a romantic boho-chic look? The possibilities are endless. Whether laid-back, classical or romantic - the bucket bag is a perfect and reliable companion for any outfit. For more inspiration simply click through JustFab’s collection of women’s bucket bags. You can buy your personal favourites right here, online and at affordable prices - and as a new VIP member, you’ll even get a 75% discount on your first bucket bag!